Coloured fire polished faceted glass crystal beads can be anodised or enamelled and come in a wide variety of colours, metal types and styles. 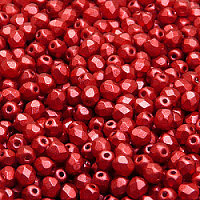 Bronze enamelled colors on the basic fire polished faceted glass crystal beads. Rainbow effect is achieved by applying multiple layer.